Okay, we have done a poor job throughout the summer updating after wheat harvest, but we’ve taken some great notes so hopefully we can get caught up. Navigating a road in between fields in the sprayer. June was crazy. We felt like we were always behind schedule. Although as farmers, we should know by now we don’t make the rain or grow the crops. It’s only by the grace and the perfection of God that we get to keep our jobs year after year. Wheat harvest finished late June, just in time for me to go with the family to Kenda’s state softball tournament. They qualified to go last year and during the regular season had beaten the state runner up. This season didn’t end the way we would have liked – both the state runner up and the state winners in 8U OKKIDS league were on our side of the bracket. They were great teams and we had a blast in Preston, OK, for the last weekend in June. But I had plenty to do when that was finished. Remember, harvest was a month behind my schedule so I hit the road running in July. July seems like a blur. I had planned to take the family on some sort of vacation, but making a living by providing a safe food and fiber supply didn’t allow for that this year. July consisted of much-needed rain, planting only one field to double-crop cotton, spraying, as well as time in the alfalfa field and several doses of working and moving cattle. A section of sprayer boom. When it rains it gives the weed seed an opportunity to grow – like crazy. So that means if weeds are growing they are taking nutrients and water from the soil that needs to be used to grow a high-quality consumable product. We had 6 inches of rain in the month of July, so lots of time on the sprayer. No complaints about the rain because we are thankful for every drop. The cattle had some pond water so we were able to give our solar paneled wells a break. Also, July was full of planning and preparing; we have decided to jump on the canola band wagon. So that automatically means we had to buy a new planter. Our no-till air seeders aren’t capable of planting canola seed. We are very excited about the new addition to Harris Farms. August has been an interesting month to say the least. The beginning of the month I was spraying, which seemed like it was taking forever because of the small showers of rain and the high temperatures. I can’t spray if the ground is wet because I don’t want to cause the ground to be compacted or risk washing off the chemical I put down. I also can’t spray if the wind is blowing more than about 17 mph or if the temperature is above 95 degrees Fahrenheit. So spraying 6000 acres in late July and August has its own difficulties. The fire in the pasture. One day we are trying to mend the boom on the sprayer. My sprayer has a span of 120 feet, so I have basically 60 feet of boom on each side. I have to be careful of any and all obstacles. Sprayer booms take a beating even under the most careful eye. My dad and a hired hand are helping fix some areas in how the boom folds up and my 85 year old grandfather calls and says, “Hey, I’ve gotten hung up in a draw trying to spray mesquite trees. I need a tractor to pull the pick up out”. We say we’re kinda busy and it’s gonna be a little bit. He calls back 2 minutes later and says, ” Come now! I’ve got a fire”! Well it didn’t end pretty as you can see by the pictures. Apparently, he was a little too impatient and got the ground hot with his tires and the grass caught fire. Around the farm, accidents happen and we need to always be aware of our surroundings. So now that I’ve told on my grandfather I might as well share about my mishap. Simply put, because of a mechanical error on a swather, the swather wrecked while I was driving. Luckily, I wasn’t on a bridge or by the creek or meeting a vehicle. The drive chain came loose and I had no way to control the swather. It safely turned into to the ditch and we stopped hard. The kids had been missing time with me, or that’s the story, so I had Kenda and Rylan with me. I think it’s because Amy had started the homeschool year back in early August and they wanted a break for the morning. So with homework in hand they came to farm for school work in the tractor that day. They haven’t asked since to ride with me. Although, I’m certain with the couple days of milo harvest coming this weekend that will change. The kids, all three of them, from the infancy stage have all enjoyed harvesting crops. A new planter on the Harris’ farm. This fall appears to have its own full calendar. We will harvest milo, go to Washington D.C., plant canola and hopefully finish in time to plant our wheat that we use for winter grazing. Then we will plant the rest of the wheat just in time to harvest the cotton before the expected hard winter sets in. Amy likes it if I can be around for holidays like Thanksgiving and Christmas! I mentioned I am going to Washington, D.C. It’s going to be a quick trip, September 8-11. We will get to discus with our elected officials how the backbone of providing a safe, consumable product is going and see how they are doing in our nation’s capitol. Amy and I were privileged to be able to go to D.C. in 2008 with Farm bureau and loved every minute of it. It is a great trip to see how the grassroots organization fights for our right to farm and ranch everyday. Before I head to D.C., Kenda will show her prospect steer at the county fair. She is very excited. I am too! I can’t believe she is old enough, but very excited about what the future holds. It looks busy! The Harris Family sent several photos to Harvest Watch that illustrate the conditions on their southwest Oklahoma Farm. We compiled them into this photo gallery. Hover over an image for a caption. A full wheat plant from one of the Harrises fields next to a 20-ounce soft drink bottle. The wheat has been stunted by a combination of environmental factors. An example of how short the wheat on the Harrises farm is. Wheat should normally be knee- to waist-high. A blooming mesquite tree – a sign that winter is surely over. A wheat field Zac planted behind cotton. This field is suffering mainly from drought. A healthy wheat head that is pollinating. This field *was* going to be the Harrises best wheat until a string a freezes, disease and now drought took their toll. A potato plant in the Harrises garden. Well it seems like only yesterday we were planting wheat, hoping for a rain, disastering cotton, experiencing our first semester of homeschool, and navigating our way through the Thanksgiving and Christmas seasons while traveling to all the family gatherings. As we begin this new season of the Harvest Watch Blog, I feel that we need to re-introduce ourselves. We are the Harris Family. I’m Zac and am married to Amy. She was raised where it still rains in Northeast Oklahoma. We farm with my grandfather and father in the Hobart area in Southwest Oklahoma. We farm wheat, cotton and alfalfa – and when it rains, we also get to harvest them. We also run a cow/calf operation with about 300 momma cows, and when we are blessed, we get to sell a few as show calves. We have three beautiful children. Kenda, our oldest, is 8 and has her own set of farming goals beginning with a miniature Hereford show steer. Rylan, our only boy, is 6 but thinks he can OPERATE any piece of machinery on the farm. He is usually easily spotted, despite his mother’s constant pleas, because he tucks his jeans in his boots similar to his Pappaw, Amy’s dad. The last of the crew is Trale’ who is almost 3, and she believes she rules the world – often we tell her she can’t boss us around. The sprayer the Harris family uses to apply fertilizer. Well now that we have the introductions out of the way, let’s get to the real reason you are reading this blog: what is going on in agriculture here in our beautiful state! God seems to be blessing us with rains just at the right time … amazing of His goodness. We are about 6 years into a major drought; I can get really technical in this, but basically a typical weather cycle lasts around 20 years, give or take, but the last wet cycle lasted closer to 30. The climatologists are basically preparing us to dig deep because they suggest it could be a long road before we are in another wet cycle. However, the wheat looks really good for the marginal moisture we have received. We were blessed early last week with a decent rain and snow to give us around 1 inch of precipitation. The week before the rain, I had “top dressed” or sprayed fertilizer on our wheat. Just about makes that timing perfect. Fertilizing simply is giving added nutrition to the crop at a specific time; if we had put it on too early, it would only grow the plant instead of adding income-producing grain to the crop. If we would have fertilized too late, we would put protein in the grain versus grain in the bin (money in our pockets). Protein is a great thing, but there is no income incentive in producing less grain with higher protein. This past week with cattle I have had to set up more solar pumps on wells. Almost all the ponds are dry, or if the ponds have water there is little to no forage in the pasture for the cattle, it’s a catch-22. One of the good things about a drought is we get the opportunity to clean out all of our ponds from the years of silting in. We will start pregnancy-checking fall calving cows on Thursday and move them off what wheat pasture we grazed and back to small, dry pastures that will require more maintenance; water being the most critical. We traded sprayers a few weeks ago, so this last fertilization in early February was its last on Harris Farms. We will hopefully get the new sprayer with 120’ aluminum booms this next week. That way, if I decide to top-dress a little more when we get more precipitation, it will be with the new rig! It was delivered without a “buddy seat” in it, and Rylan said that won’t do, dad – “Where will I sit?” Once it gets to the barn, I will add our radios and few personalized touches. The Shelbourne Stripper header, waiting for wheat harvest. Oh, I almost forgot something. I just purchased a Shelbourne header. It will run on the John Deere combine – whichever one is around here at harvest. I trade combines about as often as the wind changes directions in Oklahoma. For those of you who don’t know, this header is a stripper header, meaning that it strips just the grain off the plant and leaves the straw and everything else still standing. This is in an effort to help conserve as much moisture as possible. I can’t wait to get in the field with it and to post pictures to share! We have the privilege of sitting on the state Young Farmers and Ranchers board, and with that comes planning, working with some great people, and going to the National YF&R convention. This year it was hosted in Phoenix, Arizona. Our kids enjoy these trips, too. We learned some neat things, like cactus can live to be more than 300 years old. They are very heavy, and when the monsoon season comes, they may fall because the weight of the cactus is too much for the shallow root system to bear. One day during convention we had the opportunity to go on tours. We toured an olive oil mill, citrus farm and a 9000-acre vegetable farm that employs around 800 people. As you can tell, their agriculture is different from Oklahoma, but just as diverse! Touring a citrus farm in Arizona. The Young Farmers and Ranchers group had a great time learning about agriculture and leadership in Arizona. As a farm owner-operator, you consistently have to be planning for the “what if’s.” What if it all plays out as you originally planned, or what if it doesn’t. We have planted cotton on Harris Farms every year that I can recall, and I will be 32 this spring. On a few fields, thewheat didn’t receive adequate moisture around planting so the seed never germinated. Typically we would disaster the wheat and plant an early cotton crop. I grew up a cotton farmer, but this year it looks as though we might temporarily abandon cotton for the first time in 50 years. I am toying with the idea of having an earlier-planted and -harvested milo crop. For example, we could plant milo in the middle of March and have the crop harvested around the middle of July, instead of planting cotton May 10 and harvesting in October or November when I also need to be planting wheat. Seems like we have covered the basics … if you ever have questions, don’t hesitate to ask. We would enjoy hearing them. WOW! Has this summer flown by or what? I know it seems like just yesterday we were asked to write a blog for Farm Bureau and now we are six months in and weeks behind. Where to we begin? Lets start in reverse order for now. We had our County Free Fair, and our oldest daughter, Kenda, was in the ring with her Miniature Hereford Steer. She is only 8, so it was her first time in the ring. We were so very proud of how she handled herself. The steer did great. She was the only one on the Miniature side of things, so she was a Champion. That always makes you feel good. Since he has been home, things are going well and we are working to prepare for Tulsa State Fair. Hope it goes just as smoothly. On the farming side of things, we are still waiting for that 2-inch rain we put in a request for many moons ago… So whoever is holding this requisition up, I wish they would just sign on the dotted line. But in all fairness, God blessed us last winter and this summer with an abundant wheat crop and we were A LOT more desperate for rain a year ago. So we are just harrowing a few farms trying to smooth out some clods and getting the 3 air seeders ready to roll at the first sign of moisture. I purchased a John Deere 9650 combine about 3 weeks ago. I have multiple plans in place for the machine, but mostly I just missed having/trading green combines. I have a problem, I realize that! If you are looking for a good one, give me a call! We started fall calving. I think this may be the reason we have put off updating the blog. I kept thinking we would actually be able to keep some alive long enough to sneak a picture in! Hasn’t been the case so far! It’s been a rough go of it. Lost around 6 out of 9 from one pasture so far! That’s a conservative figure. It’s fair to say I’m hoping calving ends better than it started. It seems like the heat wave that went through here just did a number on the calves, mommas and us. We worked all day trying to bring new ones in to put under fans and misters, while someone else was hauling off dead ones. Probably the biggest adjustment and exciting news around our house is we are homeschooling our kids. They did start school locally at public school, but we have been praying for months about where God wanted us and what He needed us to do. He answered that prayer and out of obedience we are homeschooling. It has been a blessing so far. We did have the cotton adjuster out and know some numbers… I don’t want to give it all away. I will leave a little suspense for next time. Until then, don’t keep all the rain for yourself. It’s been too long since we last got acquainted, but here is the run down. We had such a blessed wheat harvest and with the right recipe seemed as though we were “running” behind. Wheat harvest took about 5 days longer than expected because of a tight harvest crew and some breakdown issues; that threw our hay cutting and baling behind schedule. Remember I mentioned how purple the creek bottom looked? Then with the few sprinkles and cooler mornings in early June, hay baling took twice as long as expected. To top it all off, the wind blew like crazy, I guess blowing in all this dry, hot weather. I say all that to say this is why I NEVER book a vacation and the one time I do this is the circumstances we are stuck with. But my request for what Amy calls the farming fairy was answered and Brent Straub spent some sleepless nights spraying for us. You can always count on a good farming neighbor. It was sure nice to go on vacation and not have the stress of leaving something undone at home. 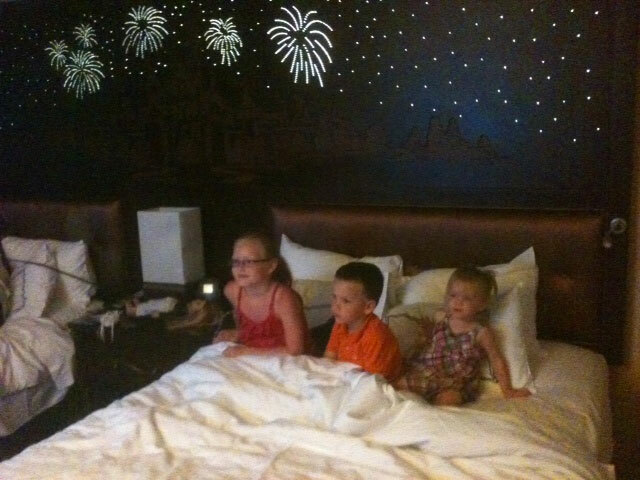 The Harris kid had a chance to enjoy Disneyland, including the fireworks headboard in the hotel! We left for vacation on Saturday, June 23. I was busy trying to do everything humanly possible to get as much done on the farm as I could – I didn’t have time to sleep. Quite frankly, that’s all I cared about for the first few days of vacation was what time we had to get up and when nap time would be! We arrived in Los Angeles, CA, the next morning after a short flight and made our way on the shuttle to the “magic” of Disneyland. 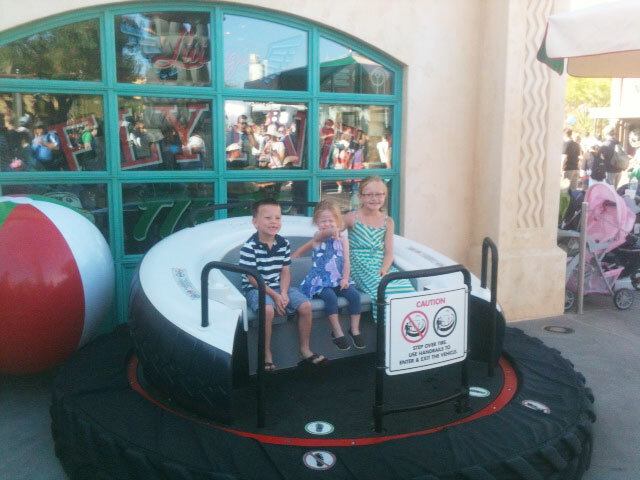 The kids had a great time! We were there Sunday through Thursday and had a late night flight to Dallas. We pulled in our driveway about 4:00 am. Amy stayed up doing a few loads of laundry because our daughter, Kenda’s, Softball team won their league in 8 and under softball and qualified for the state tournament, which started Friday morning in Preston, OK. They ended up fifth in the tournament. So back home to Hobart we go ready to take on the list at hand! Alfalfa was ready to be laid down and baled again. It is amazing what hot, dry weather does for your hay baling week. Last month, it was a two-week-plus affair, and this trip, it lasted about 6 days start to finish. We put a lot of little squares up this time – about 2000 – plus 200 mid-size squares. The cotton crop looks good considering there are rows going several directions, several sizes. I just got done spraying it for weeds and bugs. Finally, the cattle do not need attention for pink eye every other day. We have a decent chance of some much-needed rain tonight that would be a huge blessing in many ways. It would get the alfalfa, cotton, and grass a lot further down the road towards making a crop. Since I have been making paths on all this machinery I have plenty of radio time, this allows me time to ponder important things in life. For instance, Jason Aldean is someone I would like to meet and shake his hand. He is a huge advocate for agriculture through his music that hopefully the non-agriculture population can at least know something about production ag. Rylan’s favorite singer since he was two has been Jason Aldean, and I am so glad of that. I think it’s so true about the general population and how they perceive the “Fly Over States” and I’m grateful for a celebrity to acknowledge the importance of who we are. First and most aggravating, is we are still dealing with the second cutting of Alfalfa that has been rolled and rolled and rolled again because of the rains we are having. We will never complain of the rain anytime but I might complain of the stuff I can’t seem to mark off my to-do list because of it. Really thought with the wet spring we might get six cuttings of alfalfa instead of just four or five this year. Next up and falling further behind is the burn down of wheat stubble. I relearn a lesson every year that it is a good idea to spray finesse in the spring on the wheat. That basically saves the first summer spraying. This year, we only put finesse on the farms we knew had a bad problem in an effort to conserve cost. Where we did not spray we have a huge mares tail problem. I can finally say we have a good stand of cotton only because Marshall planted it twice in two different directions. I don’t think he was willing to admit defeat on the first attempt at a stand of cotton. If you know of a big broadcast header for a John Deere stripper you might give me a call! I keep accusing Marshall that he planned this as an excuse to use the Allis Strippers that are in the barn with the broadcast headers on them as well. You know the strippers that I will inherit because he will never sell them – the 1982 models. I could make someone a really good deal on them. Adding to the urgency of time constraint because of the rains; we leave in about a week to head to Disneyland. We are looking forward to the fun and the “getaway” but not looking like all the farming will be caught up before we leave. Suppose it will be here when we get back but sure hate leaving without it all done. This year, we seem to have a lot of eye problems with our cattle. Seems it’s that way across the state; we’re taking several to the vet every day. I have a bull that I bought last year that might even lose one of his eyes. Last but not least, we are still running kids to ball games. They both have week-long tournaments this week. Going separate directions is not fun. The girl’s softball team may even make it to state. Have a few more games to win but in our regional tournament they are “ranked” second. Pretty good considering they are a fairly young team and most of them didn’t even own a glove the first of March! Well here’s to hoping I can get caught up! “Catch” ya next week. This phrase applies to so many aspects of our life right now. On one hand, if you were to see the unibomber handwriting my wife uses to fit everything in our schedules on the calendar in the kitchen; it’s the official calendar of our household, you would become immediately overwhelmed. On the other hand, I truly believe that if farmers’ would quit looking at the May 9, 2012, date on their calendars and watch Mother Nature, I think a lot more combines would be rolling. That’s the thing about God, He never uses our calendar, He only uses His and His is ALWAYS good. I would be taking samples some place if the new machines would get here. I have been busy this past week planting cotton and getting all the cotton ground sprayed for round up resistant marestail. The horseweed is becoming an ever-increasing nuisance in our fields. I have been using Gramoxone herbicide to hopefully end that problem. Its original intention was for cotton defoliation or to kill the cotton plants so they can be harvested. Basically, all of the Gramoxone chemical must be applied BEFORE any cotton is up. Dad has been planting cotton for just under a week now and may finish up tomorrow. We planted 900 acres of lay out cotton including one test plot with multiple varieties. We will plant some double crop cotton into the wheat stubble as soon as the combines are parked. We will make the decision on the actual amount to be planted after wheat harvest primarily based on how we feel the weather outlook will be for the summer. I finished spraying all the cotton ground and will finish up spraying the alfalfa for grass in the morning – just in time to be completely ready to receive the second new combine. This horseweed, called marestail, is a nuisance in our cotton fields. We sprayed for it this week. It takes a lot of equipment for all of the spraying, planting and harvesting we do around here. Our daughter Trale’ loves her daddy. She’s a farm girl! Getting ready for the day. Everything seems to be running smoothly so far. I am anxious about seeing exactly how the wheat is doing. Our local gas station owner, Sam, says that he will be 80 in September and he has NEVER seen a more beautiful crop. I think it’s beautiful but my wife thinks it’s more beautiful in the bins!